A Sinn Féin motion calling for the charges to be scrapped will be debated in the Dáil today. A FIANNA FÁIL TD has said people should pay any water bills they receive before the charges are suspended. 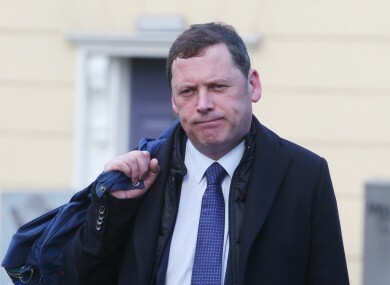 Barry Cowen, the party’s housing, planning and local government spokesperson, told Morning Ireland he has paid his water charges and others should do the same. Part of the deal struck between Fianna Fáil and Fine Gael to allow the latter to lead a minority government means water charges will be suspended for at least nine months while an external advisory body gathers information about Irish Water before reporting to an Oireachtas committee. Cowen said no bills will be sent out after 1 July. “Let’s deal with the facts as they are, until such a time as the Dáil amends the legislation the existing legislation as passed by the last Dáil [remains in place]. The then government railroaded their whole water policy … and it’s been a sorry mess ever since,” he said. Cowen was speaking ahead of a Dáil debate later today on a Sinn Féin motion calling for water charges to be scrapped and for the government to set a date for a referendum to enshrine the public ownership of water services in the constitution. Last February, a majority of TDs were elected on a mandate to scrap water charges. The overwhelming majority of people voted to scrap water charges and abolish Irish Water. The bill is supported by many members of the opposition, including TDs from the Anti-Austerity Alliance/People Before Profit, the Social Democrats and a number of independents. After initially saying he might support the motion, new junior minister John Halligan said will back the government’s counter-motion to suspend the charges, in line with the programme for government. Cowen said Sinn Féin’s motion has ”has no legal basis”. We’ll be putting forward a counter-motion. We expect the government to put forward something similar. Ultimately the Sinn Féin motion will be defeated in the Dáil this week. Cowen added that Fianna Fáil will abstain from voting on the government’s motion, which will be taken first, if it is “along the lines” of their own motion. Email “Fianna Fáil TD says people should pay water bills, before calling the whole thing a 'sorry mess'”. Feedback on “Fianna Fáil TD says people should pay water bills, before calling the whole thing a 'sorry mess'”.